So, after asking around for recommendations, I found an upholsterer who gave me a great quote for recovering the rocking chair for the baby's new room (under $200!). We talked it over and decided to go for it. I'm sure that the quote might end up being a little lower than the end price, but I still think it seems very fair, and the upholsterer is extremely responsive, professional, and willing to come pick the chair up from my home. I searched some upholstery online sources (like the recommendation one of my lovely readers suggested, www.newtoto.com) and found some great options. But after thinking it over, I decided I wanted to try and find vintage fabric. Ebay was overwhelming, so I turned to Etsy. Etsy was overwhelming, too, but I was at least able to narrow it down more easily by search term. I found this fantastic fabric, but thought I'd just mark it as a favorite and keep looking. Five minutes later, I had a panic attack that someone might buy it while I shopped around, so I went ahead and got it! The upholsterer told me I need 3.5 yards, and there are 5 yards of this, so I'm hoping it will work. The fabric is also 43 1/2 inches wide, which seems more narrow than most modern upholstery fabric, but again, I'm hoping the extra yardage will make up for it. I'm also hoping the weight will be OK. 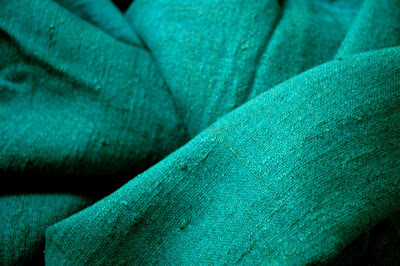 This is described as thin, almost similar to linen, but I just love the bright color and the texture looks so pretty! I'm really excited, since this is the first time we've sprung for getting something upholstered, and I can't think of a better reason than a new baby. Again, here's the chair in question. I wish the upholstery were in better shape. It really is neat. Can't wait to see your chair when it's finished. The fabric you chose is gorgeous! Krazy4Mod: Thanks so much! I can't wait either... The etsy seller said she shipped it yesterday, so let's hope the package makes it here fast! I'm so excited about getting started on the baby's room. Good luck, the estimate sounds very good. If you're planning to refinish the wood parts, you really should think about doing that first so you don't risk harming the new fabric. I just love your chair, and the color you've picked out for it is beautiful. I paid $600 for a glider rocker when my first grandson was born and just sold it on CL for $300, and the girl was really happy to get it for that price. Having a vintage chair with vintage fabric at the price you're paying for yours will be even more wonderful. Dana: Thanks so much! And thank you for sharing your prices. It definitely reassures me that we are doing OK on price. $300 is super fair for resale on your chair. That girl was lucky! So the other day I'm sitting at my desk paying bills :( I had one ear tuned in to the TV. I hear the words Atlanta, 1950s, atomic and then I hear the name.......the Lillys! I got to see your Curb Appeal the Block show!!! I was so excited. I felt like "Hey, I know her". You all are an adorable family and Roxanne is totally a cutie pie. Krazy4Mod, that's so nice of you to say! I hope you liked the show. :) It was a VERY strange experience being filmed and having to watch yourself later... There's also some weird things about the way they represented some of what happened is a little off, too, but I'm sure it's all in the name of entertainment! A lot of the "neighbors" they had interviewed were actually friends and family (including my sister!). Sadly, not enough of our real neighbors were interested in being filmed. Oh well! What a great blog! I can't wait to read more! !